These aren’t your Grandpa’s keyboard trays. With articulated keyboard trays, you can adjust them easily for long-term comfort, while typing. Nowadays, people might be working on their computers 24/7/365. They might be finishing an important document or playing online with someone on the other side of the world. Articulated keyboard trays allow you to adjust these computer accessories, so you can last for the long run. Choose from 6 different adjustable keyboard trays. Most office tables are set at an average height. Of course, people come in all shapes and sizes. Professional typists understand the proper placement for a keyboard and generally, it is not at the average table level height. Over time, this average height can cause strain to your fingers, hands and back. When you need to reach too far to type, you could strain your muscles. Your typing speeds will be slower. Adjustable keyboard trays can be raised or lowered, so you can optimize your typing speeds. Generally, you will want your keyboard close to you for shorter sessions. But, for longer sessions, there is less strain when it is further away. Freely movable keyboard trays give you greater control over your workspace. If you type for prolonged periods of time, your wrists will naturally become tired. When this occurs, you might simply want to change the position of your keyboard tray, just to change the wrist muscles used. This is a way to protect wrist health and minimize the chances of getting carpal tunnel syndrome. We, at CotyTech sell a variety of ergonomic keyboard trays, which can be easily adjusted to a comfortable height. You even have room in the trays for your mouse. We have two basic models to choose from: Clamp or Platform (Tray). The platform can hold your entire keyboard and even your mouse. Then, you can combine this model with our three types of attachments: Lever, B-Bearing Lever or Spring. Every typist has his own preferences. Unfortunately, you might not know whether you hurt your wrist, until it is too late. Don't put unneeded strain on your body. With our low-profile keyboard trays, you can prevent worker injuries. Concentrate on the task at hand with ergonomic keyboard trays. 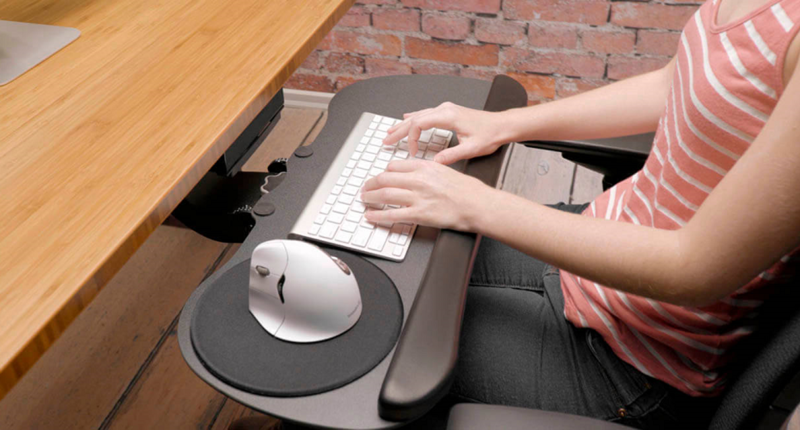 Simply tilt, swivel or maneuver your ergonomic keyboard trays into place. We provide top-of-the-line articulated keyboard trays for your custom workspace. Create the best equipment lay out to optimize productivity.